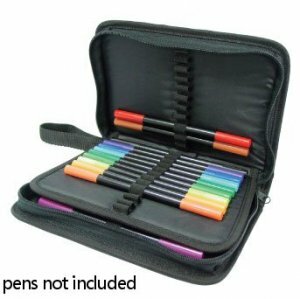 Black storage case with two compartments and holders for 48 pens. The storage case when closed is approximately 17cm x 23cm x 4.5cm. The length of pens it will fit ranges between approx. 18-19.5cm, as it slightly more narrow in the middle. A useful and practical case that keeps everthing neat and easily accesible. One criticism is that the case is a bit difficult to zip up when the maximum of pens are stored. Great item, great value for money,will be ordering another one very soon. Excellent value for money. Strong sturdy case which fits all my craft tools. Case very good quality, only one fault I found was that the Fabrico pens were very difficult to get under the elastic holders.